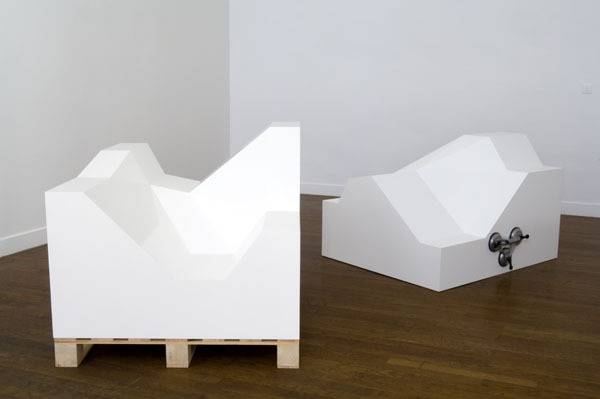 Didier Faustino presented “Broken white cube” during the first Paris Design Week earlier this month. Elaborated as a movable piece, the dimensions of the volume are matching with the shipping pallet where it is set on. The idea of transportation is increased by hand suction cups fixed on the upper block suggesting to open or close the white cube. The spectator is urged to look deeper and go beyond the surface appearance of things. Realized with a perfect slicing the broken parts seem to naturally separate themselves in a pure geometry. The rupture is made visible, touchable, and even corporeal. The viewer can approach the core of the hard matter and become a sensitive actor. Broken white cube reveals a sort of hidden ergonomic function. The opening creates a new territory for the body. Human could insert himself into the breach and fill the void. A desire to complete the missing half. An injection of humanity and sense into the matter. white lacquered wood, hand suction cups – 2007.